All of Europe’s great cities have great architecture, but perhaps Prague stands alone as the one lucky enough to see its great buildings survive this continent’s horribly destructive wars. 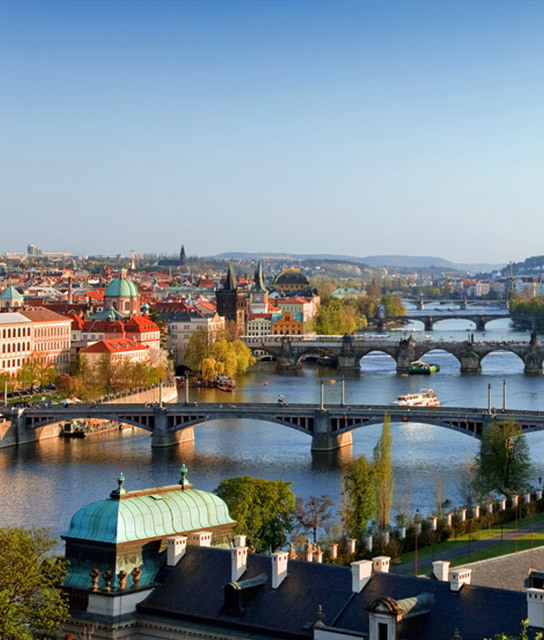 This ancient gem on the Vltava River is called “The City of a Thousand Spires” for a good reason. A millennium worth of architectural creativity reigns here, from gothic to baroque to cubist to art nouveau to anything in between. Hotels in Prague might just as easily be filled with scholars studying the city’s wide design traditions as with revelers come to sample some of Europe’s best beer. Whether you visit Prague Castle, Charles Bridge, or the medieval, cobbled streets in the Old City, this great Czech masterpiece can often feel as if it is, well, showing off. The hotel Prague experience, needless to say, can be a busy one in all seasons. Below find a list of our selection of boutique and luxury hotels in Prague. In one of Europe's most beautiful medieval cities, Eva Jiricna's award-winning design is a masterpiece of contemporary cool.